The three cornered tussle betweenPeterite Lakshina Rodrigo, Ricmondite Charith Asalanka and TrinitianRaveen Sayer is still on for the Sunday Observer/ Mobitel Mostpopular Schoolboy Cricketer Of The Year plum at the end of the 13thweek count. Rodrigo polled in 29, 668 votes toAsalanka’s 26, 258 and Sayer 15767 . 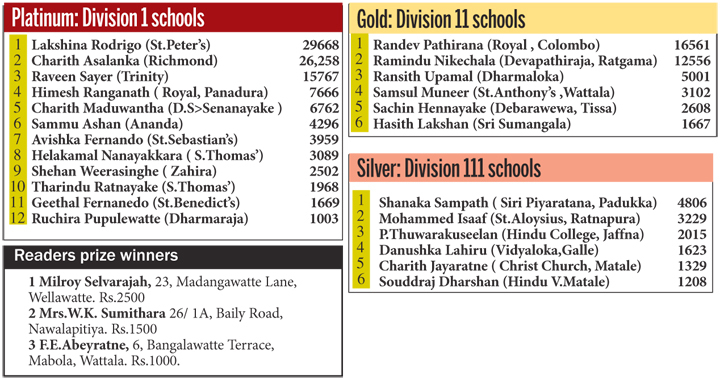 In the Gold segment fordivision two schools Randev Pathirana of Royal College and RaminduNikechala of Devapathiraja College Ratgama if fighting out afairly close battle with Ransith Upamal of Dharmaloka College,Kelaniya also joining. In the silver Shanaka Sampath of SiriPiyaratana ,Padukka is still perched on top with 4806 votes, Mohammed Isaaf of St.Aloysius College Ratnapura and P.Thuwarakuseelan of HinduCollege, Jaffna is in the second and third places.